Our free pearl necklace giveaway contest gives our visitors a chance to win a free pearl necklace that they can give to their sweetheart as a Valentine's Day Gift. But more importantly, we introduce you to Pearl Paradise where you can find quality pearl jewelry including earrings, necklaces, bracelets, rings and even loose pearls that make great baby gifts at amazingly low (read: cheap!) prices. Speaking for myself, I am thrilled to make their acquaintance and was positively delighted with the freshwater pearls that they sent me to review. In fact, to say that I was tickled pink with the lovely pearl necklace would be a huge understatement! I am writing a review of my beautiful pearl necklace and I’m going to tell you all about how to enter for a chance to win a free freshwater pearl necklace in our pearl jewelry contest. But first, I want to talk a little bit about the importance of presentation and how PearlParadise excels in this area. Picture this; Two ladies just went through hard labor (for more hours than they want to remember) and are holding their precious babies in their arms when the proud fathers walk in the door carrying flowers and pearl necklaces as a very special thank you gift. For the sake of making comparisons, we will call them Husband A and Husband B. Father A presents the mother of his newborn baby with the flowers and a cardboard box with pearl jewelry inside and Father B tenderly kisses the mother of his child, tells her she is more beautiful than any flower on earth and presents her with a strand of creamy pearls inside a jewelry case lined with black velvet. Which new dad do you think did the best job of showing his heartfelt appreciation the best? Father B gets my vote! Father B was smart and ordered his new mom gift at PearlParadise and got not only a discount price on his pearl necklace but a signed Certified Appraisal Form stating the appraisal value of the pearls. Oh yeah, I’m bragging about these pearls and you can just bet that I’m about to tell you how fine this jewelry is. My necklace is an 7.5 - 8.0mm white Freshwater Pearl Necklace of AAA quality. I like colored pearls and will probably buy some later, but only after I have a complete set of white pearls. I chose an 18 inch necklace with a 14kt yellow gold clasp and this is the perfect length for me. I enjoy wearing tailored blouses with my suits and at 18 inches the necklace falls right where it should! I have never considered my neck to be one of my best features but this necklace may just change my mind. I am now of the opinion that it would be difficult to find any stone that surpasses the classic look of pearls with casual or professional attire and if they make my neckline look great just think what they can do for yours! These pearls from PearlParadise.com are beautiful, the prices are to die for PLUS I got a signed certified appraisal form and a cleaning kit with instructions on how to care for the pearls. Even the paper of the appraisal form is rich and creamy and not just plain, white photocopy paper. So, if they’re so great why are they giving away free jewelry? Because they want their customers to make educated choices when shopping for pearls and are confident that when reviewers compare their pearl jewelry to what’s for sale in the local jewelry store that they will see for themselves that the same strand that is identical in size, color, and quality, would be much more expensive at regular retail prices. NOW you see why they have giveaways! If you have stopped by looking for Valentine's Day gift ideas OR recommendations for baby shower gifts you already know what a believer I am in starting out baby girls with pearl baby jewelry whether the babies were born in June (and pearls are their birthstone) or not! Dads have also gotten a "not so gentle" nudge in the direction of a pearl necklace (set?) to show their appreciation to new moms for presenting them with the ultimate gift of a son or daughter. Dads who visit here should love Pearl Paradise for giving them a chance to win the free pearl necklace giveaway contest for their sweetheart just in time for Valentine’s Day AND for offering all of the jewelry they will need to complete the set at such cheap prices! Even if you don’t win the giveaway, it’s good to know that you can buzz right over to Pearl Paradise and buy a new mom or baby gift! Moving along to the details of the free pearl necklace giveaway contest, you can enter for a chance to win the very same AAA Quality freshwater pearl necklace that I reviewed and if you don’t win you can take advantage of the discount code for 10% off for those who purchase the exact item (FWN200) for the duration of the giveaway. THE PRIZE: 1 18-inch, 7.5-8.0 mm, AAA quality cultured freshwater pearl necklace, with a 14kt gold clasp with an appraised value of $945.00. If you don’t win this prize you can buy this necklace at Pearl Paradise for only $189.00 and they have others that start at only $70.00! You can pick up extra entries after completing the mandatory entry and each action counts as 1 entry (unless I specify otherwise) and you must leave a separate comment for each action. MANDATORY ENTRY: You MUST visit Pearl Paradise, take a look at their inventory of pearl jewelry, return and leave a comment telling which of their pearls that you would love to own. Hit the "FACEBOOK LIKE" button on this page to like the giveaway! 3 entries! 'Like' Pearl Paradise on Facebook and write a message on their wall that you arrived there via this giveaway! 3 entries! Blog about the free pearl necklace giveaway contest linking back to this giveaway AND Pearl Paradise. Leave the URL where you blogged. 5 entries! Grab my Unique Baby Nursery Ideas button using the following code and leave the URL where it is posted. Follow MSBABY AND PearlParadise on Twitter AND tweet about this giveaway. After your initial "tweet" you can score an extra entry each day by tweeting once per day (Limit 1 tweet a day) and leave URL where you tweeted in your comment. **Please leave your email address on each comment (one you actually check, please!) in order for me to be able to contact you! 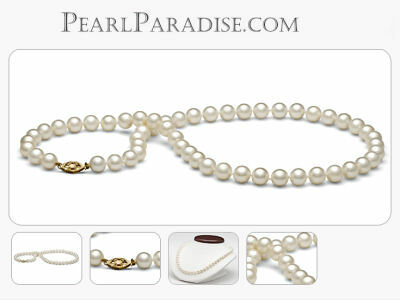 The PearlParadise Pearl Necklace Giveaway ends Wednesday, February 9 at 11.59pm (CST). The winner of the prize will be drawn by the random number generator at Random.org and will be notified by email. The Winner will have 48 hours to respond or a new winner will be drawn. The free pearl necklace giveaway contest is open to USA residents ONLY that are 18 years old or older except where prohibited by law. I’m sorry, but previous Pearl Paradise contest winners are not eligible. For the record, the thoughts and opinions expressed on my blog are my own and are not influenced or swayed by monetary or product compensation. I received a complimentary pearl necklace and no other compensation. I love love loved the 6.5-7.0 mm White Akoya Pearl Bracelet. what a beautiful and unique bracelet to add accent to any wardrobe!! I'd love to own it! I thank you for the reminder, I have been busy this AM/PM, break time. My babygirl "Pebbles" would look adorable in pearls. I love the 9.0 - 9.5 mm White Freshadama Fresh Water Pearl Bridal Sets that start at $1458. I adore the black freshwater pearls in any form; bracelets, earrings or necklaces but I would be happy with any! I simply adore the AA+ Black Akoya Pearls, I never see such a lovely and very high quality piece of Jewelry. I would love to own a gorgeous set of pearls. LOVE your Pearl giveaway - My Fav @ Pearl Paradise is the Tahitian pearl "Tin Cup" style necklace, so beautiful! I love the 7.5-8.0 mm Double Strand White Freshwater Pearl Necklace. I LOVE all the pink pearls in the collection. No matter what style...they're SOOOO beautiful!! I love the Chocolate Tahitian Pearl Necklace. I like the Bonnie pearl and diamond ring! I would love to own the 8.0-9.0 mm Tahitian Tin Cup Round Pearl Bracelet. Thanks for giving us a chance to win! I absolutely love the Tahitian Baroque Pearl and Diamond Pendant necklace! Would love to win this to give to my mother-in-law as a gift. She lost all her pearls in a robbery. I like this: 18-inch AA+ 15.1-16.6 mm Golden South Sea Pearl Necklace. It is for dual purpose..gold and Pearl..together..blend in one..and goes with any kind of clothing..It has attractivness and elegancy of gold and pearlin one!!! I love the lavender coloured pearl necklace freshwater in 18 inch! I LOVE ALL OF THE PEARLS ON THEIR SITE, BUT MOST OF ALL MY NUMBER ONE FAVORITE IS MOST DEFINITELY THE ONE IN YOUR REVIEW. IT IS THE MOST BEAUTIFUL AND I WOULD TO WIN IT FOR MYSELF AND TO SAVE FOR MY NEW BABY GIRL! THERE IS NO BETTER WAY TO BRING HER UP WITH STYLE THAN TO WEAR CLASSIC PEARL JEWELRY! I WANT TO TEACH HER TO HAVE TASTE AND I THINK THE PROCESS STARTS VERY EARLY! WHEN SHE HAS THE MOST WONDERFUL AND THE PRETTIEST MOMMY IT WILL LEAVE A LASTING IMPRESSION! SO I REALLY HOPE THAT I WIN THIS PEARL NECKLACE IT'S AWESOME! Join in and write your own page! It's easy to do. How? Simply click here to return to MOM JEWELRY GIVEAWAYS.